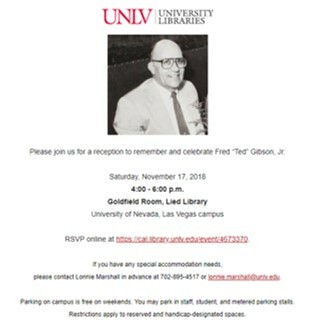 Please join us for a reception to remember and celebrate Fred “Ted” Gibson, Jr. Parking on campus is free on weekends. You may park in staff, student, and metered parking stalls. Restrictions apply to reserved and handicap-designated spaces. If you have any special accommodation needs, please contact Lonnie Marshall in advance at 702-895-4517 or lonnie.marshall@unlv.edu.